“I’m sorry we are all out of nettles.” This is one sentence that never fails to hurt my heart. When I go to an herbal apothecary or health food store in need of nettles, it is serious business. I’m not the only one. 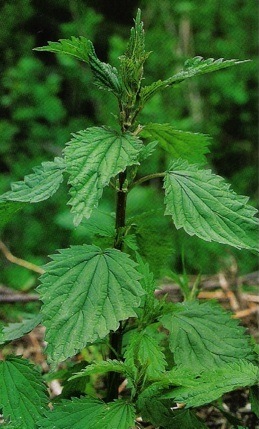 Herbal enthusiasts who suffer from allergies will tell you that spring without nettles is guaranteed to be a bit rough. One of the reasons many places can’t keep this wonder herb in stock is because it works so well at relieving allergies. Urtica Dioica, is pure green magic and once this plant gets in your blood, you will not want to be without it. This prickly plant is packed with minerals like iron, magnesium, zinc, calcium and an abundance of chloropyll. Nettles nourish us on a deep level. They are healing for the kidneys, the urinary tract, and the nerves. Nettles are also wonderful for pregnant women and nursing mothers. I know I have nettles to thank for the fact that I had any energy at all when I was dealing with my newborn and my two year old. I drank nettle infusion almost daily then. The milk flowed and I was able to get things done. An interesting thing is that since using nettles and red raspberry regularly, I no longer have anemia which I had for over a decade. Last summer was my summer without nettles. Everyone seemed to be out of stock. After weeks of classes, conferences, teaching, long hours and day to day household work, I found myself experiencing a kind of exhaustion I had never known. I could not figure it out. I was enjoying the work I was doing. I was eating (fairly) well. I was sleeping five or six hours a night, but I was lethargic. At times my hands even shook slightly. Herbalist Margi Flint, who was teaching at the Women’s Herbal Conference, diagnosed me in two minutes flat. She took a look at my tongue, asked me to hold out my hands and said “Ahhhh, you’ve got an adrenal issue.” I did some research and it all started to click. We run ourselves so ragged and deal with so much constant stress that our adrenal glands get all out of whack. Christiane Northrup, M.D, writes, Here are some typical signs that your adrenals may need attention: You awaken feeling groggy and have difficulty dragging yourself out of bed. You can’t get going without that first cup or two of caffeinated coffee or tea. You not only rely on sugary snacks and caffeine to get through the day but find you actually crave sweets, particularly in the late morning or afternoon. (Perhaps you’ve even been diagnosed with hypoglycemia.) Your thinking is foggy and you have memory problems. You suffer from recurrent infections, headaches and depression. At night, though exhausted, you have trouble falling asleep as the worries of the day replay in your head and you suffer from insomnia. Ordinary stresses have an impact that is out of proportion to their importance. I remember looking around me at the people holding Red Bull and clutching cups of coffee and realizing that I was far from the only one dealing with adrenal issues. My course correction was fairly simple. I needed to nourish my kidneys by going to bed by 11 (according to some holistic systems the most restorative time for the kidneys is between 10pm and 2 am) and by getting my hands on some nettles (which I did at that very conference.) Within a week I felt like a new person. This was a powerful teaching on the medicine of sleep and the medicine of nettles. It was also a clear signal that I needed to learn to deal with stress in different ways. Yoga, Orisha dance and meditation have all been extremely helpful when I am working to navigate stressful situations. I sing my praises for nettles to any and every one who is interested. Have you experienced the magic of nettles yet? I do so enjoy your stories. They are written from the heart, with honesty, clarity and quite a bit of magick. Green blessings indeed. I really appreciate your comments. Writing about the herbs has become a passion and I am thrilled to be able to share these stories. Something tells me you have more than a little magick to share here. 🙂 I look forward to hearing from you. So glad that I was led to check out your website and blog today. I will have to keep coming back for more. I love Nettles! I am constantly sharing the wonder of Nettles with those around me and take it myself to regulate blood pressure and get rid of excess water retained by my body. There was a run on Nettles in the DC area a few years ago after an article by Tom Wolfe, owner of SMILE Herb shop wrote about their benefit. Luckily, I have some growing in my yard, and will experiment with Nettle Pesto this year. Oh my goodness, nettle pesto. That sounds incredible. Please let us know how it turns out and share that recipe!